Composite video (RCA connector) is a combined video signal that contains the luminance, hue, and saturation data on a single cable. This is the lowest grade of video signal used by most video equipment. The typical connector is a single RCA Jack with a Yellow marking. Composite video is poor in quality and is only used as a last resort. In no circumstances is it recommended to run a plasma or projector with composite video, due to the fact that it will only feed approximately 250 lines and the picture will be so bad you will kick yourself for buying a plasma. S-VideoThe next step up in signal quality from Composite Video, S-Video separates the luminance part of a video image from the color part. This provides a clearer picture due to the fact that each portion of the video signal is assigned it's own processing channel.The S-Video connector is a Mini-Din 4 Y/C, also known as S-Video Connector. S-Video is primarily used on S-VHS VCRs, satellite dishes (non-HDTV) and DVDs where the target connection (example, your television set) will not accept component connections.S-Video will run 480i signal, but not a 480p signal. Component video (RCA connectors) is a high-grade video signal that separates the 3 basic components of a video signal (luminance, hue, saturation). Component video is often displayed as Y, Pb, Pr, or Y, Cb, Cr. The typical connectors are three RCA Jacks with green , Blue, and Red markings. This system is used primarily on DVD players and HDTV receivers. A component video connection is capable of accepting full high-definition signals up to 1080i. It is important to note that when looking to purchase a surround sound receiver, to be sure that it has component video switching. When purchasing component video cables try to keep your run below 18ft. NOTE: Although DVI and VGA may give a better image, The component video cable is the favored connection method since you can switch video feeds thru your Surround sound receiver. RGB (VGA) Video is one of the purest forms of component video with separate color and luminance signals for each of the Red, Green, and Blue components. RGB is the standard signal type used on most computers. This input can also accept component video in using a RCA to RGB adapter ( see bottom of page). This is very useful if you need to feed a DVD player and a HDTV receiver into a Plasma display if your surround sound receiver does not have component video switching. 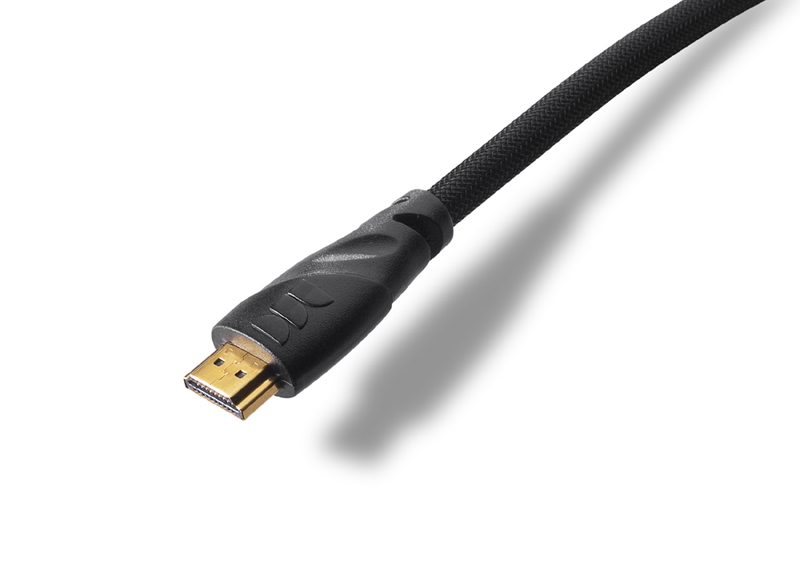 HDMI is the first and only digital interface that is able to combine uncompressed audio and video over a single cable. Possessing a bandwidth of 5 Gbps, transmissions over HDMI are currently using less than half of that. This leaves plenty of room to expand the technology in the future. HDMI is fully backwards compatible with DVI, and will supplant it as the interface of choice over the next few years. HDMI provides an interface between any compatible digital audio/video source, such as a DVD player, a PC, a video game system, or an AV receiver and a compatible digital audio and/or video monitor, such as a digital television (DTV). HDMI cable supports all HDTV formats. Optical Cable: This cable is a fiber optical cable which transfers digital audio signals from your DVD or HDTV receiver box to a surround sound receiver. Digital sound is converted to light and transmitted thru the Fiber optical cable to provide you with full digital surround sound. 3.5 mm Mini Jack: A mini jack transfers stereo sound from video games and small items such as portable dvd players and laptops to your stereo or plasma. For example : If you wanted to connect your laptop or desktop computer to your stereo you would use a minijack to RCA audio adapter cable. Also many plasma screens have a audio out minijack which allows you to connect powered computer speakers. BNC Connector: A BNC connector is simply a connector that is used on many Plasma Tvs and video projectors instead of a RCA connector. This unit simply turns and locks to prevent cables becoming loose. In most cases users simply use a BNC to RCA adapter and connect standard RCA cables. The adapters can be purchased at a electronic store for a dollar or two each.